I’m notorious for being a ridiculously lazy person when it comes to looking after my hair. I have tried in the past to tame my hair, have natural beautiful curls & keep it slick – never has this happened! A simple, quick and easy way for me to give my hair a bit of a pamper is to use an oil. Now, I’ve tried a lot of different oils, including L’Oreal, highstreet brands, L’Oreal but I’ve never really had ‘WOW’ results. Yes, they made my hair feel nice and soft, but I didn’t notice a big difference in overall condition, nor did I notice an improvement in the length of my hair. 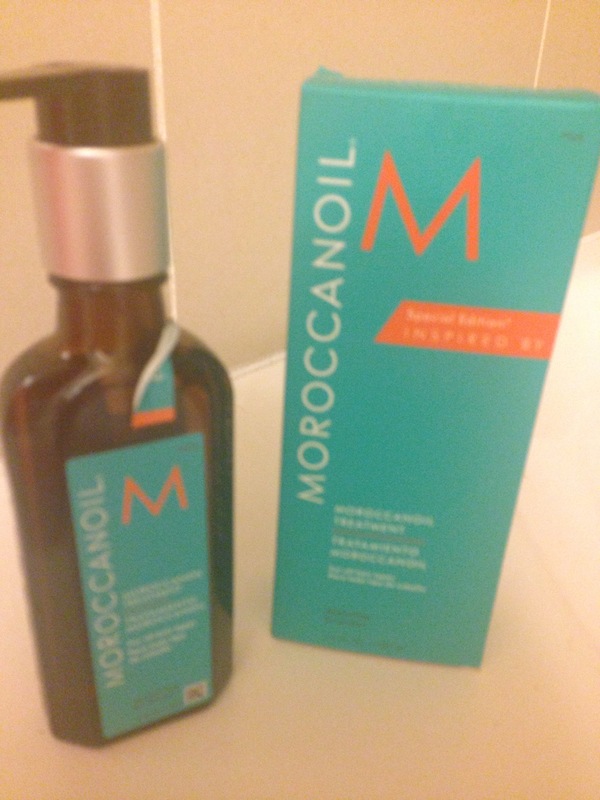 I have used Moroccanoil when I stayed with my sister years ago & it was impressive… I just couldn’t justify the price tag. Until I was walking to subway the other day, walked past a salon and guess what caught my eye…!!! The Holy Grail, the elite, the superstar of the hair oil world, Moroccanoil is a product every oil-addict just has to try. I’d wanted to try it for an absolute lifetime, but really couldn’t justify the pricetag. It cost $45 for the 100ml Bottle, complete with screw-top lid and a pump, which I thought was a nice little addition. The oil smells somewhat similar to the others on the market, although it definitely has a touch of luxury to it, and putting it on my hair is a real treat. Best used on the lengths and ends of my towel-dried hair once out of the shower, and I occasionally use it on dry hair if it’s been looking a tad frazzled. It makes my unruly hair SO much easier to manage; combing my hair after washing is no longer such a chore, and doesn’t take half as long as it used to. Once dry, my hair feels in a much better condition, better than it has in years in fact; seriously soft and smooth. It’s been know to help promote growth within your hair. Overall I am so impressed with Moroccanoil and it is most definitely the best hair oil I’ve ever tried. Is it worth the $49price tag? In short, yes. Once my bottle is used up I will certainly be buying another, as I can’t get enough of the stuff, and it is a super-duper easy way of looking after my hair, without much effort at all. Have you tried Moroccanoil before? What did you think?